Send Butterscotch Cake - 1 Kg. (Midnight) to Chennai. Gifts to Chennai. Send Cakes to Chennai. Description : Send 1 Kg. eggless sponge cake at Midnight with butterscotch flavoured icing and topped with whipped cream to Chennai to your near and dear ones on any special occasion. Cakes are always on high demand as birthday or anniversary gifts. 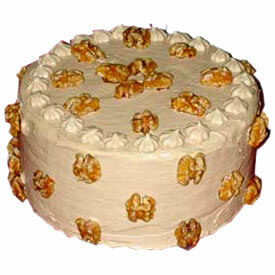 This cake can be sent along with Gifts to Chennai anytime through Gift2Chennai.com. The delectable taste will surely tinkle the taste buds of your dear ones in Chennai. Kindly mention the occasion date in the Special Instruction field when you are placing the order. The date of the delivery should be one day prior to the occasion date.For example: If the birthday is on 25th of the month, in the Special Instruction mention the occasion date and select the Date of Delivery as 24th.